Thank you 40 Under 40 visitors! As a reader of the Wichita Business Journal’s 40 Under 40 publication, we know you are serious about your business. We’re serious about helping your business succeed. 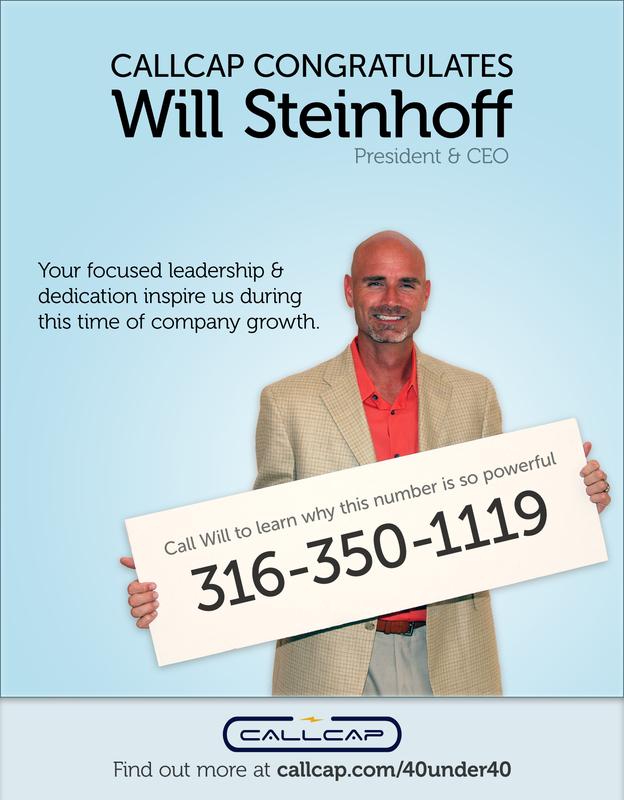 Read on to find out why a Callcap number like Will’s is so powerful, and how this power enables your business to excel. At first glance, this phone number is no different than any other; 10 digits, including the Wichita area code, that directly calls Will’s office phone. But behind this number is the power of Callcap’s suite of tracking, monitoring and analysis services. Callcap helps you take the guesswork out of your marketing plan. If you call Will’s number listed in the 40 Under 40 ad, not only will he be able to tell that your call came from that publication, he will also be provided with a slew of other valuable information about you as an ad-respondent. If publically available, we can display your name, address, demographic information, whether you are on the National Do-Not-Call Registry and even present any past phone calls you may have made to us. To the business owner, this knowledge is a huge advantage when distributing your marketing budget. Know which ads generate the most response, and quit dumping money into “dud” marketing that doesn’t produce results. With Callsurance enabled on his Callcap phone number, each call Will receives filters through our trained Call Analysts, in near real-time, to be graded on criteria he has established. In combination with our call tracking and lead measurement reporting, you not only know which ads generate the most response, you also know for a fact which ads generate the most successful sales or service bookings. We can even match calls from your website so you can make informed decisions on web advertising. Your clickthrough rate may be amazing, but how many of those clicks result in definite sales conversions or service bookings? Without tracking the performance of your phone lines, you miss the most important part of the puzzle. Even better than this additional insight into the performance of your marketing, you also directly have the power to recover lost sales leads. For example, if someone calls when Will is away from his desk, that call would be flagged as “Negative – Call not answered” by the Call Analyst. Immediately, we notify Will with details on who called, what happened and how to call that person back – giving Will the vital information he needs to recover that potential lead. For businesses, this second chance is powerful! If you had the power to recover otherwise lost revenue from botched sales/service calls, how would that affect your bottom line? In 2010, we enabled our customers to capitalize on over half a billion dollars in reclaimed revenue.